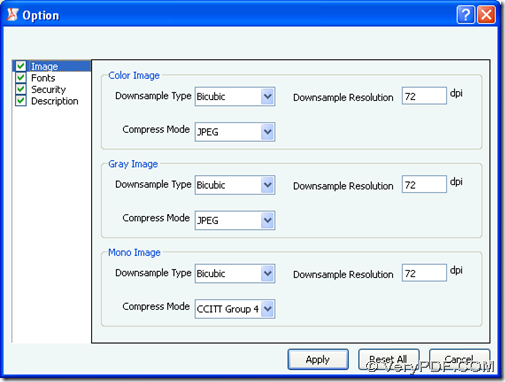 This article is about how to downsample images in batches within PDF file with VeryPDF PDF Image Downsample Tool. VeryPDF PDF Image Downsample Tool is a professional PDF compressor for Windows users to downsample images in PDF file in batches accurately. Please enter homepage of VeryPDF PDF Image Downsample Tool for more information. For free trial on VeryPDF PDF Image Downsample Tool here, please click at here. where you need to click check-box Image firstly, then according to your color of images in PDF, you need to select one option between color image, Gray Image and Mono Image. 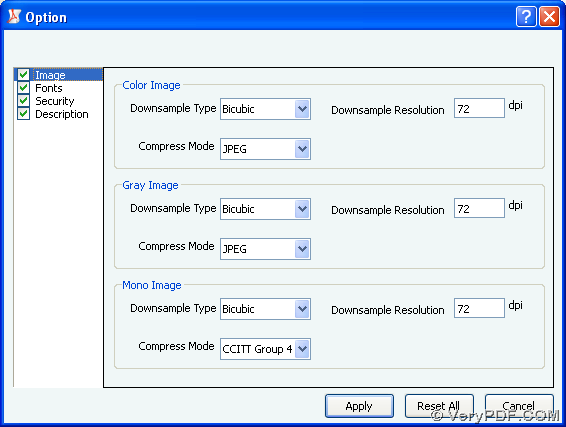 Then, downsample type can be selected among closed, subsample, average and bicubic, likely, you can customize one option at downsample resolution and select one option among Auto, ZIP, RLE, JBIG2 and CCITT Group 4. If you want to embed all fonts, compress fonts, subset fonts, you can click check-box Fonts > click related check boxes one by one; if you want to encrypt PDF file with user password and owner password, please go to panel Security > type user password and owner password with permission selected directly, for example. After all basic work to downsample images is finished here, please click Apply in order to save all settings here directly. By now, the illustration about how to downsample images in batches within PDF file is the end here, and if you still feel confused in some aspects here, welcome to leave your comments here or contact our support team. This entry was posted in PDF Compressor and tagged downsample images, in batches. Bookmark the permalink.